Uber, a controversial taxi alternative that connects private drivers with riders, has its Hong Kong office raided by Regional Crime Unit of Kowloon West today as reported by ABC news. Three Uber Hong Kong employees (age 21 to 29) and five Uber drivers were arrested according to the Hong Kong Chinese media Apple Daily news. Let’s think about it for a moment. A government department helping a multi-billion foreign high-tech company with “significant support” including “advice on market entry strategy prior to its launch” sounded like a perfect task and job well done for investHK. And that would fit HKSAR Chief Executive CY Leung‘s often talked about desire to establish an Innovation and Technology Bureau (創新及科技局) very well. 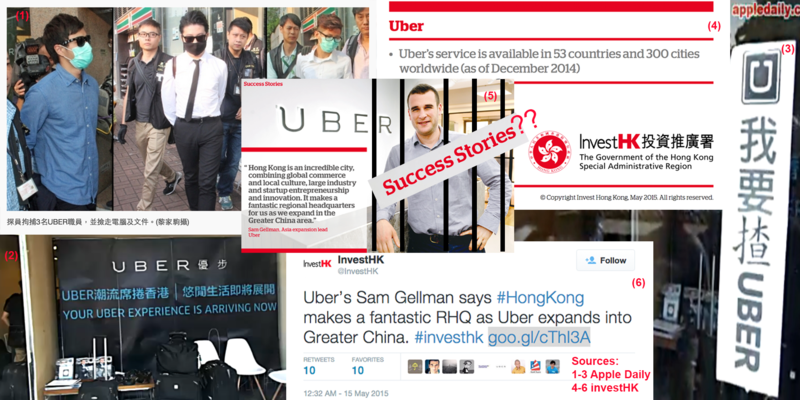 It is not like Uber has changed its business model since May 2015 when Hong Kong government talked about her “significant support” including “advice on market entry strategy prior to its launch” in its investHK Success Story. This reporter is not a lawyer but to many casual observers, the Hong Kong government’s prior “significant support” including “advice on market entry strategy prior to its launch” might be seen by some, fairly or unfairly, as potentially a form of entrapment. Does Hong Kong still have a stable business environment where innovative entrepreneurs can work under a fair legal system where rule of law still matter? Will the Hong Kong government explain what rules, laws, or regulations have changed between May 2015 (a “success story”) to August 11th where people were arrested and equipment and records confiscated as part of a criminal case investigation? An earlier version of this report is cross-posted to examiner. Note 1: Uber is not operating in Calgary even it operated briefly in 2014 before insurance concerns halted the service. In separate polls conducted by the city and the company finds majority of Calgarians embrace idea of Uber. And more importantly, officials from cities like Calgary are willing and working with Uber to try to bring more choices to citizens in a manner that protect the safety of riders. Note 2: This reporter has uploaded saved copies of the English version of investHK Success and Chinese version of investHK Success Story 投資推廣署 – 成功個案 as part of this news reporting as per fair dealing provisions of copyright law for readers to read and research for themselves. 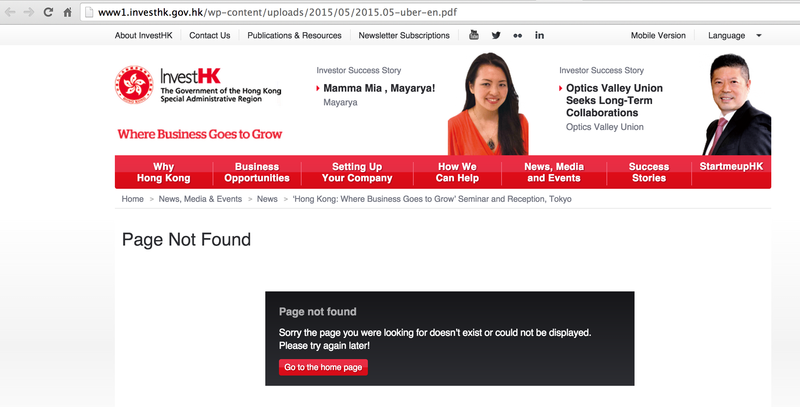 At press time, it appears that both the English and Chinese “success story” files have been deleted from the investHK website. Some Hong Kong Facebook users voiced their suspicion that the HKSAR government might have deleted the files to avoid embarrassment or incriminating evidences. 11th August 2015 Update: On the night of August 11th, Uber Hong Kong stated “Uber ensures that all trips have insurance coverages” and they will “fully support their drivers” and “fully cooperate with government officials, work to improve current legislation, putting safety and benefits of passengers and drivers first.” (rough translation from Chinese). Further report here (首次放蛇搗信用卡收費白牌車 警打擊Uber 拘5司機3職員) and here (警檢控 料將案件作測試個案). This entry was posted on Tuesday, August 11th, 2015 at 1:01 PM and is filed under Business, China, Hong Kong, Law. You can follow any responses to this entry through the RSS 2.0 feed. Both comments and pings are currently closed.